Similar to your tile and grout floors, your tile grout in your shower can get grimy looking (and feeling) as well. This article with helpful tips for keeping your tile grout looking new in your shower comes from Angie’s List. First, a quick fact about the grout used when your tile was installed. Grout is made with a water repellency built in to provide years of use when maintained. In a perfect world, your grout should look shiny and bright forever. However, that’s not the case in most of the homes I visit. In most houses, even with the best use of cleaning practices, yellowing and mildewing still persist. So why does this happen? So, how do you keep your showers looking nice? When you read the ingredients on the back of your shampoo bottle, do you see dyes and colorings in the product? If so, choose a new shampoo that is more natural without colorings in them. You will be doing your shower a favor, and more importantly, your body. 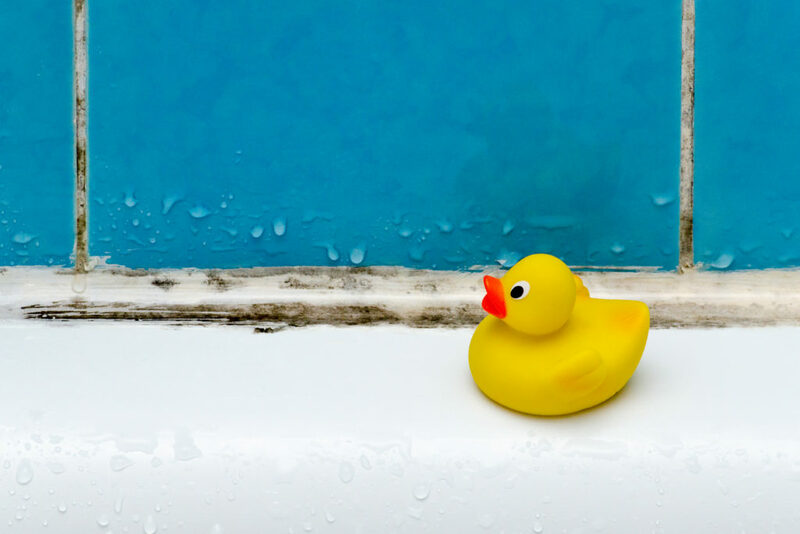 Dyes are not good for you or your family’s health and can also stain the grout in your bathroom. Harsh cleaners may make your grout look cleaner, but they also strip away the water repellency. Bleach is especially bad. A mixture of approximately one-third white vinegar to two-thirds water is what I recommend to clean grout. Use a soft scrub brush with a little elbow grease. Most home stores offer sealing products. They add water repellency back into the grout that’s lost over time. Grout that is sealed will be more stain resistant. I recommend sealing at least once or twice a year, depending on how many people use the shower on a daily basis. Preferably, you’ll want to find a squeegee with a suction cup that will mount in your shower, making it handier when you need it. Using it after each shower allows less water to dry on your grout, tile and shower doors, thereby leaving fewer mineral deposits behind.